Little Tokyo Service Center and its partners were notified late yesterday (June 24) by the City of Los Angeles that its proposal for the city-owned Alameda and First parcel (a.k.a. the Mangrove site) will be recommended by the Office of the Chief Legislative Analyst for City Council approval. 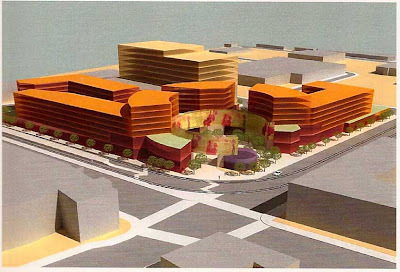 Little Tokyo Service Center and its partners in this project -- Kaji & Associates and Urban Partners -- have proposed a mixed-use development for this 5 acre site adjacent to the Little Tokyo/Arts District Gold Line station. The proposed development, named Nikkei Center, consists of nearly 400 units of mixed-income rental housing, 180,000 square feet of office space, 80,000 square feet of retail space and approximately 1300 parking spaces. The office space is tentatively planned as the headquarters for L.A. Care Health Plan, a health maintenance organizaton created to provide public health benefits to under-served communities. The development team unites three diverse and experienced members of the downtown Los Angeles real estate community. Little Tokyo Service Center started in 1979 as a neighborhood-based social service agency, and in the past 20 years has developed affordable housing and community facilities in Little Tokyo and surrounding communities. Kaji & Associates has been involved in Little Tokyo for several decades. The firm provides business consultancy services in areas ranging from real estate, economic development, international trade and emerging technologies. Urban Partners is a real estate planning, investment, development and management firm. Their projects include transit-oriented developments such as the Del Mar, Wilshire Vermont and Washington National Stations. The lead architect for the project is world-renowned The Jerde Partnership. Jerde brings a vast amount of experience designing exciting destinations such as Universal CityWalk, San Diego's Horton Plaza, Las Vegas' Bellagio and Roppongi Hills in Tokyo. Rounding out the design team are Togawa Smith Martin Residential and Ted Tokio Tanaka Architects. The team expects City Council approval shortly and will work with City agencies and community groups to further refine development plans. Construction is expected to begin in the fall of 2009 with completion by the end of 2011. Congratulations to Little Tokyo Service Center, Kaji & Associates and Urban Partners!